Now more than ever, retail businesses need a strong and reliable security presence. While loss prevention and data breaches have always been a security concern, ongoing terrorist threats and mass shootings have made it imperative for retailers to provide a safe and secure environment for customers and employees. At Signal 88 of Rancho Cucamonga, we understand the changing landscape of retail security, and provide custom retail security solutions for businesses throughout Rancho Cucamonga, Rialto, Fontana, Colton, Ontario, and the surrounding areas. No matter the size of your retail space, it’s important that your business is secure and your employees and customers feel safe. At Signal 88 of Rancho Cucamonga, we have the experience, knowledge, and technology to bring you and your business peace of mind. Our mobile patrol services, with flashing lights and well-marked, branded vehicles, provide a visible security presence and strong deterrent throughout your retail property. Equipped with Wi-Fi technology, our officers can respond to situations in real-time, and with GPS technology, you have the ability to track the officer’s location, so you know where your security personnel are located at all times. Cloud based availability, so our clients can access it anytime, anywhere. 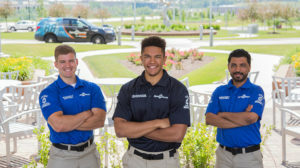 At Signal 88 of Rancho Cucamonga, our first-rate security personnel are among the best in the business, and approach retail security in the Ontario area with integrity, honesty, and passion. Each of our security officers has been trained to our high standards and undergone lengthy criminal background checks and drug testing. And because there’s always new technology and changing threats, our officers are given many opportunities to continue their professional development with coursework and additional training. Our thorough training practices and high standards result in exceptional service and coverage for our clients, as well as invaluable peace of mind. With Signal 88 of Rancho Cucamonga, you get the experience, resources, and expertise needed to protect your retail business from criminal elements. Our retail security services are available to retailers and businesses in Rancho Cucamonga, Rialto, Fontana, Colton, Ontario, and throughout the surrounding communities. Call (877) 522-5588 x102 today to schedule a free consultation with Ontario’s trusted retail security providers.